When it comes to air conditioning systems, the dialogue is usually about keeping humans cool. This is understandable and natural, but in all of our attempts to keep ourselves cool, we often forget about the needs of our pets, who react to extreme temperatures much differently than we do. Pets don’t have the ability to sweat, which has a huge impact on how they handle the heat. Sweating, as annoying as it is sometimes, is our body’s main mechanism of temperature regulation. Sweat hydrates us and cools us down. Unfortunately, cats and dogs are not only unable to do this, they also have a thick coat of fur to deal with. This one applies for dogs more than cats. Every dog needs their daily walk and play time, and you’ll have to go outdoors to provide it to them. Many pet owners make the mistake of going out in the middle of the day or the afternoon, where the sun beats down the hardest. Shade is limited due to the overhead position of the sun, and everything is just hotter in general due to the heat radiating off the pavement, roads, etc. This is the most miserable option for both yourself and your pet. Instead, go out at a time when the sun is more forgiving and shade is more abundant. This is much more manageable for your canine buddy, and you’ll both come out happier for it. While, again, this is an issue more exclusive to dogs, it’s still a big problem nonetheless. It’s not uncommon for dogs to accompany their owners on most of their errands. Most dogs love to be out with their owners and said owners are usually all too happy to comply. Unfortunately, this often leads to dogs having to do some waiting time in the car when their owners make stops at locations that aren’t dog friendly. Let’s just get this out of the way — do not, under any circumstance, leave your dog in the car during the hot Florida summer! You may think it’s okay if you leave all the windows open. Wrong — even a human would get uncomfortable in that situation, and profuse sweating would be our only protection against the heat. Dogs have no such mechanism, and you can bet even a well-ventilated car will be too much for their bodies to handle. Heat stroke can happen within minutes when it gets as hot as it does in Pasco County, so you need to avoid this at all costs. One mistake that a lot of pet owners make is not considering how blisteringly hot sidewalks and pavement can get. Even if you wait until a time where the sun isn’t beating as hard, surfaces such as asphalt and concrete can retain heat for hours. Unfortunately, this is something that’s easy to forget when we’re wearing shoes. Hot asphalt isn’t a problem for most of us because our footwear protects us against it, but dogs have no such luxury, and they might be suffering without you realizing it. The answer is simple — just be cognizant of your surroundings and make sure you’re not making your dog walk on what may as well be hot coals. One simple and easy way to make your pets just marginally cooler is to put ice cubes into their water. It won’t make a tremendous difference, but it certainly won’t hurt. The best part is that this is extremely easy and quick on your end. We tend to crave cold liquid when it’s hot, and it’s not hard to imagine that pets probably enjoy the sensation too. This is true for both dogs and cats! 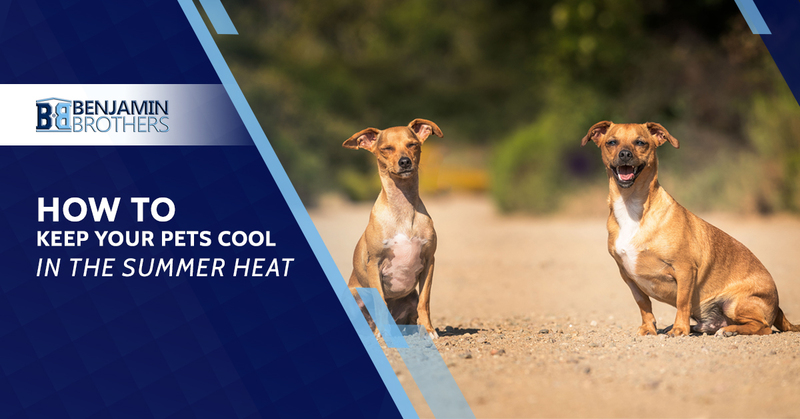 In most houses and apartments, your pet probably won’t have a hard time finding some kind of enclosed or shady space where they can find reprieve from the heat. However, not every home is created equal, and it’s possible that your pet doesn’t have the space that it needs to keep cool. Whether you have dogs or cats at home, it would be a boon to them for you to create shady spaces that they can retreat to when the heat is particularly strong. Hard floors are a plus — they stay cooler for longer, but they also have the opposite effect if they get a lot of sun throughout the day. What are you doing to make sure your home stays cool? Even though abundant sunlight is nice, try closing the curtains and limiting the amount of sunlight that gets in. Your kitty might choose to sleep in select sun spots every once in a while, but when the sunlight is invasive, they’re not going to be quite as content. In most occasions, both air conditioners and fans achieve the same purpose in helping people to feel cool. In fact, we have even recommended using fans instead of your air conditioner as a way to save on money and power in past blogs. However, in the case of your pets, fans are not a viable replacement for air conditioners in a hot home. The reason? Air conditioners actually reduce the temperature of the room, while fans merely circulate air. The reason the latter is able to cool us is that moving air helps us to feel cool even though it’s not lowering the temperature. Unfortunately, pets with fur coats have a lower threshold to which they can handle the heat, so if the base temperature of the room is too hot for them, fans will have only a minimal effect in helping them to stay cool. It won’t hurt, but it won’t be nearly as effective as an air conditioning system, and if you want some peace of mind, it’s important to make sure your HVAC unit is functioning without any sign of damage. More than anything, your pets need a nice, cool space at home where you can rest assured that they won’t suffer from overheating. There’s no better way to do this than to invest in your air conditioning system. Preventative maintenance is incredibly important in ensuring that your HVAC unit runs throughout the summer, and if it ends up breaking down, it will not only be uncomfortable, it could be downright dangerous for your pets. For quality HVAC installation, repair, and maintenance services in the Pasco County and Tampa Bay areas, there is no better company to call than Benjamin Brothers. Contact us today!